I had to miss that rainy sketching at University Village because I was in San Antonio, TX visiting my mom and nursing a very, very bad cold that left me without much drawing umph. The long sketch is at the Arneson River Theater in the heart of the San Antonio Riverwalk--still lush and beautiful after so many years. 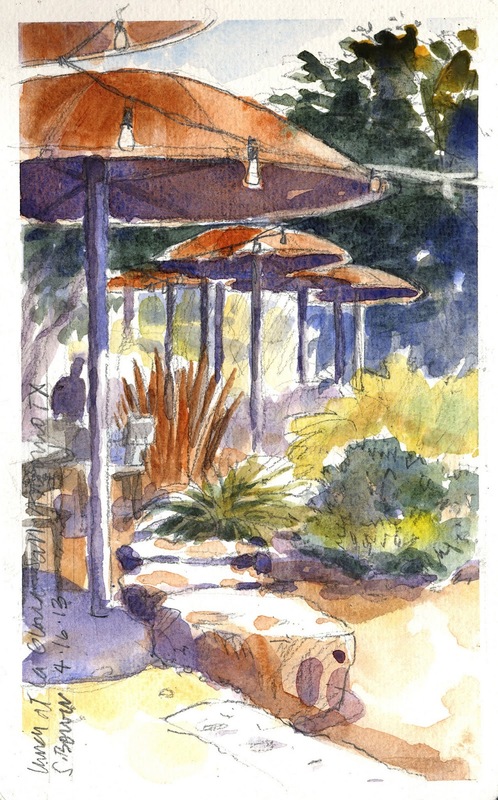 The rusted steel umbrellas are sketched during lunch at La Gloria, a great restaurant in The Pearl along the Riverwalk extension. 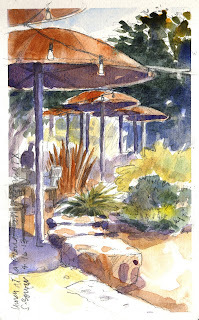 and also feeling very lucky to have gotten into the Urban Sketchers Symposium in Barcelona!!!! So excited! I am so jealous of your trip and all the opportunities to sketch in France, Spain and Italy. Civita is a magical place and I want to go back again someday (after i finish paying for kids college!). Have a great time and look forward to seeing what you sketch and paint.